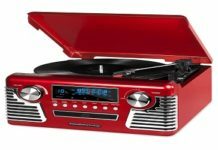 With an all in one record player, you will be able to enjoy your favorite songs, get the advantage of updated features of stereo systems, and connect speakers or use headphones or privacy. 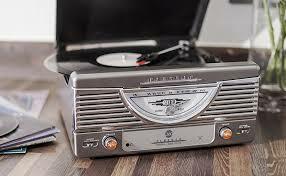 The best all in one record player allows you to listen to vintage and modern music by using auxiliary and US inputs. You can connect any device, such as smartphones, tablets, and Bluetooth. These record players are equipped with a lot of unique features to satisfy the needs of advanced users. 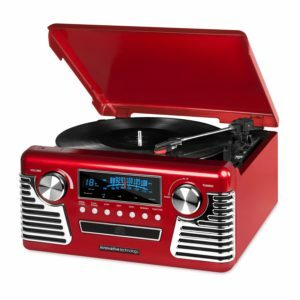 For your convenience, we have a list of top rated all in one record players. 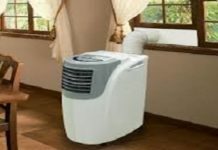 You can choose a suitable model as per your requirements. TEAC LP-R550 CD and USB recorder is an ultimate recording and playback solution. This compact and modern system includes USB audio interface, FM/AM tuner, Cassette, CD, and turntable. It allows you to transfer a collection to digital format with USB computer and CD recording functions. With this new recorder, you can fill your room with quality integral bass reflex stereo speakers and connect your pair of headphones to enhance your private listening experience. With its CD recording features, you can convert cassette and album into CD format. LP-R550USB allows you to record CDs from FM/AM, cassette, auxiliary input and vinyl input sources. 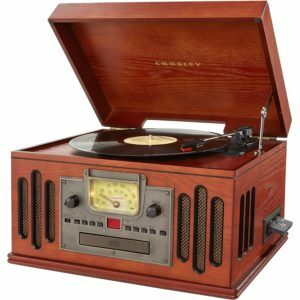 LPR-550USB turntable provides three-speed assortment supporting 33 1/3, 45 and SP 78rpm records. With a cue lever located on the tonearm, you can gently lift and place stylus to avoid scratching. You can store AM and FM stations into its present channels 1 – 9 respectively. Auto-tuning selection allows you to find these stations quickly. 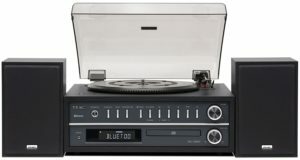 The accessible cassette player is located next to turntable on the top of LP-550USB. RCA input stereo is located on the rear panel so that you can easily connect it to an external source of audio for recording and playback. Teac is a modern turntable for digital enthusiasts and vinyl listeners. With this turntable, you can play your vinyl collection without any trouble because it is compatible with all record sizes. The all-in-one MC-D800 may playback at 33rpm, 45rpm, and 78-rpm speeds. The player is equipped with a stylus having a sapphire tip. Teac provides an optional diamond needle for specifically SP-style records. The digital radio and CD player are packed with incredible features like integrated LCD screen to read different options of menus easily. Shuffle and repeat play options are easy to program and radio can store almost 20 FM and 20 AM stations as per presets. Moreover, listeners can set music to turn off or at a particular time, set a sleep timer and adjust an alarm clock. With integrated speakers, you can get great quality of sound and attach through an RCA standard jack to add advanced speakers to this player. The turntable of Teac comes with a Bluetooth so that you can conveniently connect with digital devices. It comes with a remote so that you can control music even from different corners of your home instead of being hitched by auxiliary cords. 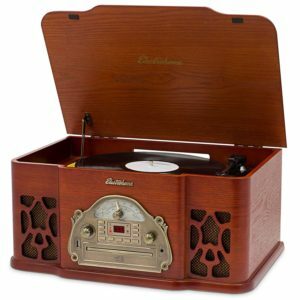 Beautiful Victrola nostalgic modern record player allows you to listen to your favorite music. This all-in-one player offers six ways to play music and three speeds turntable (33 1/3, 45 and 78 RPM. You can wirelessly play your favorite music from FM radio, Bluetooth enables devices, Aux-in 3.5mm jack to play music from your non-Bluetooth devices with a cable, Aux-in RCA jack and headphone jack. The turntable is exceptionally versatile to play standard records in different sizes and playback speeds. The cartridge and needle may cause issues; though, they don’t place sufficient pressure on a few records to play accurately. The attractive wood-finished exterior design completes with king-size dial display and analog radio in the middle. The stereo speakers can boast sound of amazing quality, though it is able to attach exterior speakers via an RCA jack. The all-in-one record player has Bluetooth for digital wireless playback. It has an auxiliary input to attach non-Bluetooth devices. It comes with integrated CD players and cassette so you may take advantage of this record player. This inexpensive player can be an excellent choice for those people who want vintage turntable attached with cassette and CD players and Bluetooth capability. Crosley is an excellent name for innovation in the field of a turntable. You can listen to music with this advanced and innovative music player. Record player of Crosley combines the best style with digital essentials. This turntable is adaptable with an ability to play records of different sizes like 7-inch, 10-inch and 12-inch music records at 33 1/3-rpm, 45-rpm and 75-rpm with the use of an expendable diamond stylus. The double stereo speakers can produce a full-bodied and rich sound. The wood frame of this player can enhance the quality of voice. The shiny exterior of the record player gives it a unique look. The vintage-looking Paprika veneer finish of hardwood frame gives an ideal sheen while managing the illusion of a player from the era of the 1960s. The correspondent radio requires physical tuning that may need practice for people to understand digital functions. The front has a CD player to enhance its vintage look. The built-in cassette player is hidden on the side of the wooden frame. If you want high-quality sound, you must use this music player. It comes with a vintage design and a variety of capabilities. Bring versatile audio and retro style experience to home with this unique record player. 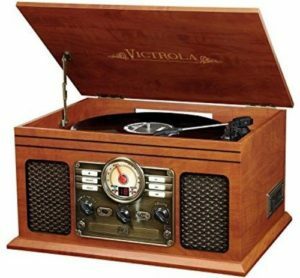 The Victrola record player retro stereo comes with USB digital encoding and Bluetooth. 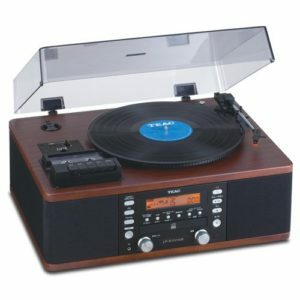 The turntable can play FM/AM radio, wireless music, vinyl records, and CDs. You can enjoy clean and crisp audio in different formats. With its wireless capability, you can stream music almost 33 feet away. Enjoy your favorite music from this Bluetooth compatible recorder. An integrated CD player allows you to listen to your favorite music by inserting your CDs. You can enjoy crisp sound through a strong stereo speaker. It allows you to do USB encoding for MP3 conversion to digitize your vinyl records to MP3. 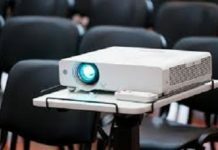 You can connect to a computer through integrated USB cable and recording software compatible with Mac and PC. It can be a solid choice for anyone who needs an affordable record player. With the exclusion of cassette tape rerun, it comes with everything as per your needs, such as vinyl recording and Bluetooth capability. Combine the charisma of the past with the advanced technology of today. Backed by more than 100 years of developing top-rated audio products, Electrohome has a particular design of record players with modern features. You can play your whole music library with a classic 4-in-1 turntable system. You can relax while listening to your MP3’s, FM/AM radio, CDs and other record collection. Feel free to connect your tablet or smartphone. Enjoy a vinyl collection of your dad with an automatic belt-driven turntable. The turntable can spin 7, 10 and 12” records at the speed of 33 1/3, 45 and 78 rpm. If you want to enjoy private listening, you can use headphones and enjoy your favorite music without disturbing others. Along with all listening options, you may convert your CD collections and record to MP3 to move with your preferred music. You can fit the natural tone of the vinyl collection on the moveable USB drive. This system is excellent for entertainment and antiquated look that makes it an ideal addition to your house. Subtle details, such as amber lighting on tuning dial of analog, antiqued verdigris faceplate, and rotary knob control complement your decorations. 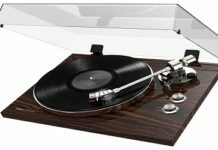 Buyers Guide of All in one record player? While purchasing the all in one record player, it is essential to consider essential features. Vinyl records are available in different sizes, such as 7, 10 and 12 inches. The intended speed of playback is 33 1/3, 45 and 78 rpm. As per the stretches of the record collection, you will get a mix of different sizes. It is essential to check these options so that your selected record player must play your selection. The needle may not have a massive difference in the quality of sound, but it may impact durability and cost. Sapphire needles may be cheap, but you have to replace them after 50 to 100 hours of usage. Diamond needs can last for hundreds of hours, but these are expensive to substitute. The all-in-one record players have speakers either connected externally or integrated into the frame. The quality of speakers may vary enormously. Make sure to invest in a good set of speakers for record player while analyzing prices and check the input type the player has to connect external speakers. Numerous record players use an RCA jack, but some may use substitute inputs. A few players may not have the functionality to connect an extra set of speakers. Before purchasing a record player, it is essential to consider your needs regarding cassettes or CDs. These features are not available with all record players. Some may not have a radio or cassette players to accept high cartridges or leave an AM tuner. Numerous all-in-one players come with the best recording features. The best features allow you to record your favorite vinyl collection into MP3 digital files. It will not damage your collection, but keep its back up and permit you to listen to this music while traveling in a vehicle. You must consider this feature if you have lots of vinyl records. You have to plug the USB drive into record player and computer. Moreover, some top-rated record players can record your vinyl directly to CDs, cassettes or radio recording into crisp digital files. Your selected record player should have an ability to play music through Bluetooth. This feature is essential for numerous users. It may be necessary for those people who prefer the use of digital audio. The wireless speakers are available nowadays at cheap prices than all-in-one players. The Best all in one record player can be an excellent choice to remove the dust from your vinyl record and bring your music together from dissimilar media formats. These players offer analog and digital audio worlds. These may have a blurred line between two by efficiently recording your old records to MP3s digital or wirelessly linking to a smartphone to play particular tunes with your vintage speaker. Numerous vintage designs look good that you may need, even if you are not interested in recording. 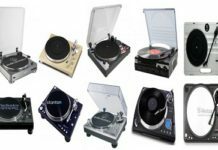 If you want the best record player, you can consider any one of these options. These record players are equipped with modern features to let you play music from different media formats.